Suicide is the second-leading cause of death among teenagers in the United States. The 2017 data from the Youth Risk Behavior Surveillance System (YRBSS) provide valuable insight into adolescent suicide trends; these data show that, overall, the percentage of high school students who report seriously considering suicide has increased since 2009. 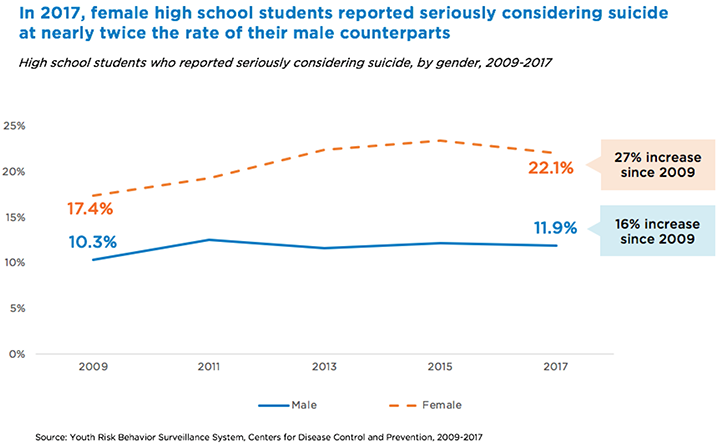 Importantly, this measure shows the same trajectory as the suicide rate, with the most significant increases for both occurring among female high-school students. This blog post explores the trends in self-reported serious consideration of suicide and suicide rates, from 2009 to 2017, overall, by race and ethnicity, and by gender. In 2017, 17.2 percent of high schoolers reported seriously considering suicide, compared with 17.7 percent in 2015—not a statistically significant decrease. However, the 2017 number is up by 25 percent since 2009, when just 13.8 percent of students reported seriously considering suicide. A breakdown of these reports by race and ethnicity finds that multi-racial students were the most likely to consider suicide, with nearly one-quarter of students reporting that they had considered suicide in the 12 months before the survey. They were followed by students who are American Indian or Alaska Native (19 percent), Native Hawaiian or Other Pacific Islander (18 percent), Asian and white (17 percent), Hispanic (16 percent), and black (15 percent). Black students were significantly less likely than white students to report seriously considering suicide in 2017 (14.7 and 17.3 percent, respectively). Multi-racial students, however, were more likely (23.2 percent) than their white peers to consider suicide. Female high school students reported seriously considering suicide at nearly twice the rate of their male counterparts in 2017 (22.1 and 11.9 percent, respectively). The rate of females seriously considering suicide has increased significantly since 2009, when it was just 17.4 percent—a 27 percent increase. The rate among males did not significantly change (10.3 percent in 2009 to 11.9 percent in 2017). While the YRBSS data are self-reported by students, they reflect the similar but steeper trajectory of the rate of suicide, which increased by 33 percent over a similar timeframe—from 7.5 to 10.0 suicides per 100,000 15- to 19-year-olds from 2009 to 2016. Suicide rates are highest among American Indian or Alaska Native 15- to 19-year-olds (16 per 100,000), and lowest among black and Hispanic youth (6 and 7 per 100,000, respectively). The suicide rate among black 15- to 19-year-olds is significantly lower than among white youth (6.0 versus 10.8 per 100,000 in 2016). However, both rates have increased significantly since 2009: by 43 percent for blacks (4.2 to 6.0 per 100,000) and by 32 percent for whites (8.2 to 10.8 per 100,000). The suicide rate for Asian and Pacific Islander adolescents increased the most in terms of percentage increase, by 78 percent (5.0 to 8.9 per 100,000), while it increased by 26 percent among Hispanic youth (5.4 to 6.8 per 100,000) and remained at a steady but high 16 per 100,000 among American Indian or Alaska Native youth. Similarly, among young men, the suicide rate increased by 28 percent (11.6 to 14.8 suicides per 100,000 15- to 19-year-old men from 2009 to 2016). 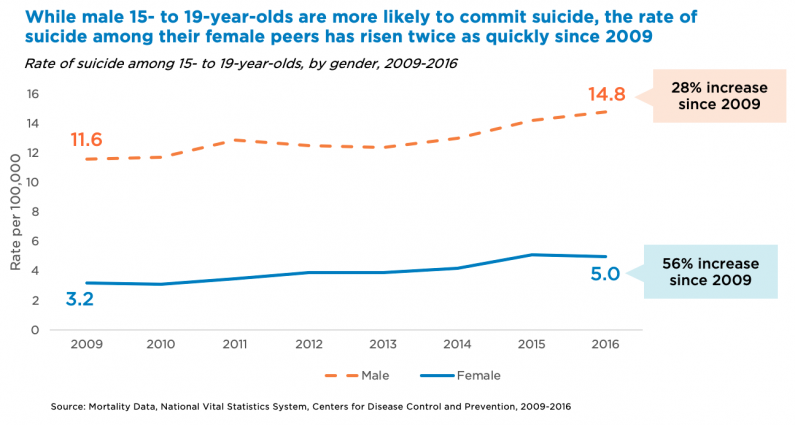 Although males are nearly three times more likely than women to complete suicide (14.8 per 100,000 15 to 19-year-old men in 2016, compared to 5.0 per 100,000 among their female peers), the gap is narrowing. Suicide rates among females increased by 56 percent from 2009 to 2016 (3.2 to 5.0).